Here at the Foundation we’re always delighted to host visitors who share our affinity for all things O’Neill. But we’re particularly thrilled when a visitor can add to our understanding of O’Neill’s life and times. Such a serendipitous event occurred earlier this year when Ian Ross took a tour of Tao House with our National Park rangers and mentioned that his grandmother had known O’Neill in New London, Connecticut in the early 1900s. 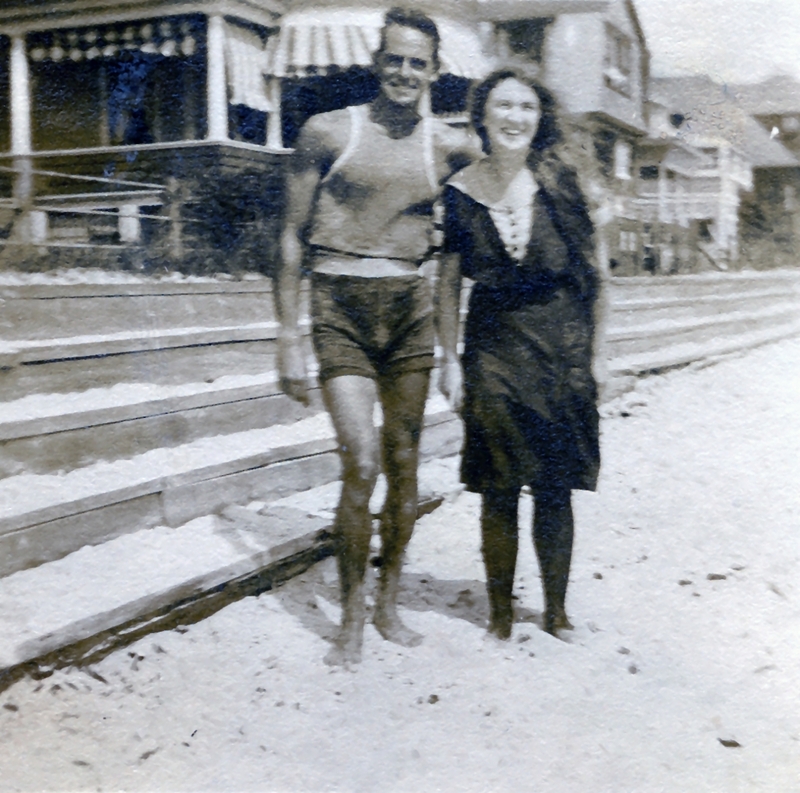 He followed up his visit with proof, providing two charming photos of the playwright on the beach with his grandmother – in one of them he’s even smiling! Ross’s letter below provides the details. On Thursday Alan gave our family a nice tour of Tao House. During the tour, I mentioned that my grandmother had known Eugene O’Neill at New London, CT in the early 1900’s. Attached please find some photos from my grandmother’s sister’s photo album inscribed “Marie and Eugene O’Neill.” They are undated, but from the photos surrounding it in the album, it appears to be from the 1914-1915 timeframe, though they could be from several years earlier. The Marie in the photo is my grandmother, Marie Frances Scroggie, before she married my grandfather, Herbert v. Wiley, in 1917. I recently wrote a book about my grandfather and his naval career, and in researching family history came across this photo. Marie, born in 1893, died in 1930 during the birth of my own mother, also named Marie (Marie Wiley Ross). 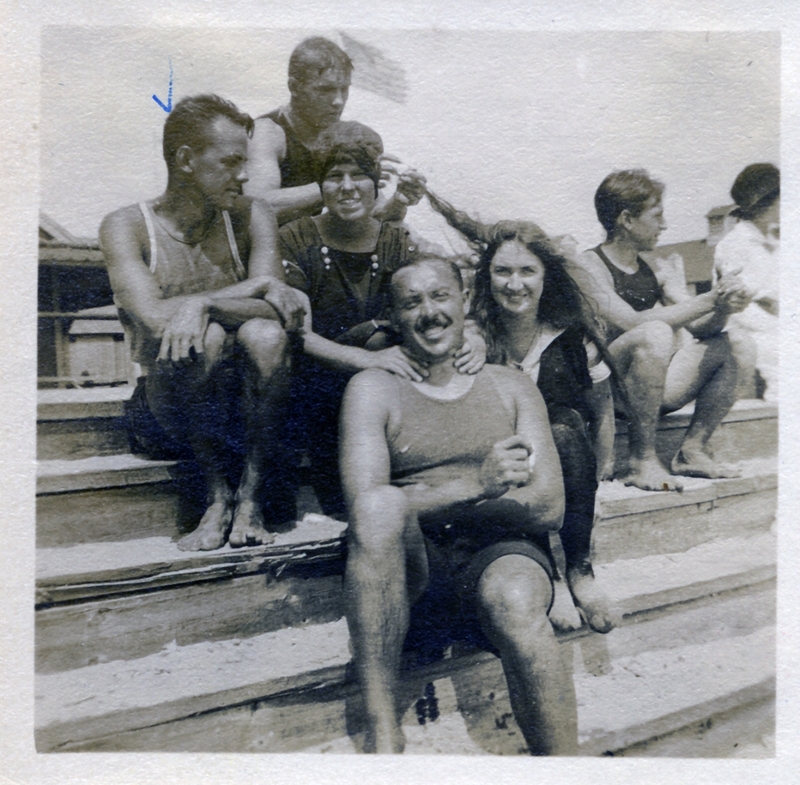 Over the years, my mother and her Scroggie cousins (from two younger sisters of Marie) have retold family lore that Marie “dated” Eugene O’Neill in New London before she met her future husband. I’m not sure what “dated” really means. It might have just been this quick pose with him on the beach one day. But there are some other indications they may have had more contact. In her 1917 wedding announcement in the New London newspaper — and her obituary 13 years later — Marie is referred to as bright, cheerful and “one of the most popular members in the young smart set” of New London. Also, in her sister’s album, there are other photos of Marie in the bathing costume of the day frolicking with a number of young men at Ocean Beach. I don’t see O’Neill’s face among those other young men, but clearly she spent more than just a few passing moments at the shore…. As did he. I personally doubt there was much more than an acquaintance between the two, but it has been a nice tidbit of family history through the generations. Thank you again for the nice visit the O’Neill home.